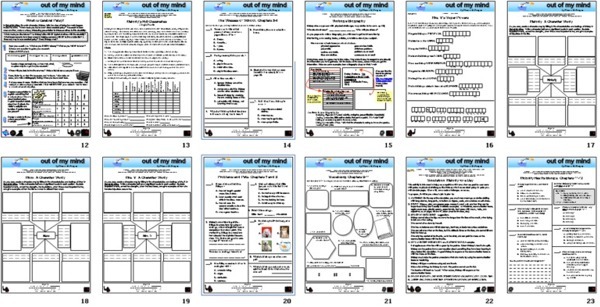 You can purchase the 41-page unit PLUS a Jeopardy-type game for Out of My Mind for immediate download in both PDF and Powerpoint formats for only $19.95, available NOW! Melody was born with a love for words and music. She remembered every word she ever heard. To her, music was colorful, and each had its own distinctive taste. Her head was soon filled with melodies, tempos, and rhythms. She longed to use the words, to dance to the music. But Melody was born with neither the ability to speak her beloved words nor with the coordination to dance to the music she loved. Melody was born with cerebral palsy. Inside her mind, she was a genius with a photographic memory. Inside her mind, she was a girl who longed to have friends. Out of her mind, her arms, legs, and head were uncontrollable. The only sounds she could make were grunts, squeaks, and noises. She could not feed herself. She had to be taken to the bathroom. Melody COULD smile and her eyes were bright windows where her parents could see in and know she was intelligent. If only she could talk. Out of My Mind by Sharon M. Draper documents Melody's bittersweet story of her struggles to be normal, to be understood, and to share what is inside her mind. Melody tells of being diagnosed as profoundly retarded when she was 5-years old. She shares the anguish and determination of a family, one dear neighbor, and rare teachers who love her, who believe in her, and persevere to help her connect with the world with a Medi-Talker and through inclusion classes. Still, the friendships she so dearly seeks are tenuous and stormy. 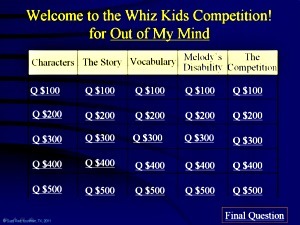 What will happen when she finally steps out of her mind and earns a place on the school's Whiz Kids team? Out of My Mind is a story everyone should read, from 3rd grade through adult. It will awaken the "normal" person's understanding of handicapped persons and will encourage interaction and warmth when the two meet. 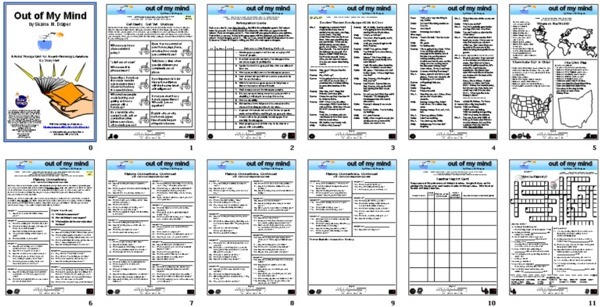 The Kids' Wings literature guide invites group discussion, problem solving, research, writing, skill building, authentic writing prompts, and a culminating interactive Jeopardy-type game in Whiz-Kid style that allows the entire class to participate at the same time. Teachers who want students to empathize and welcome interaction with those less "normal" than they will want make this book part of their classroom libraries. 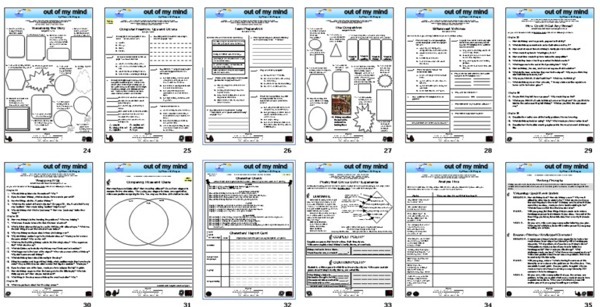 A 41-page unit PLUS interactive Jeopardy-type game, perfect for lesson planning, handouts, or projection on your SmartBoard for Out of My Mind by Sharon M. Draper is now available! 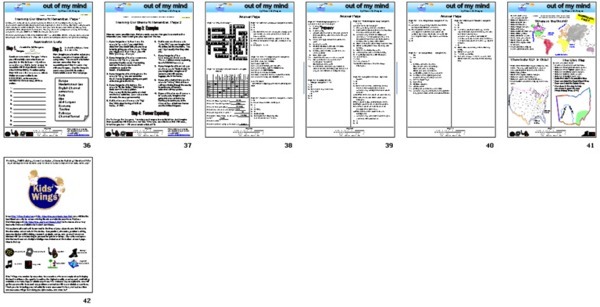 Out of My Mind is one of the 26 literature guides for award-winning literature in our Extraordinary Destinations Collection. 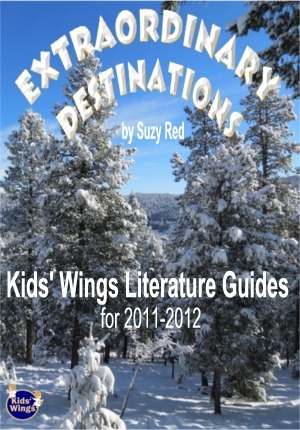 Though you can order each unit individually for about $18.95, if you order Extraordinary Destinations you will get the 26 units for less than $1.00 each! Order now! Quantities are limited! Buy Out of My Mind NOW!